As almost every automaker is talking about electrifying its future product lineup, plug-in hybrid and fully electric vehicles will flood the market within the next few years. Consumers will obviously get to recharge their vehicles at home or using public charging stations in order to get from point A to point B, changing their transporting habits altogether. What’s left for those who still want a fuel-efficient vehicle, but don’t care about the hassle of having to plug in their cars on a regular basis? Are off-the-grid, conventional hybrids still relevant today? Honda seems to think so, as it reintroduced the Insight for the 2019 model year. When it hit the market back in December 1999, the first-generation Insight was an odd-looking, two-seater minicar with a drag coefficient of 0.25—an extraordinary figure at the time. In Canada, its fuel combined city/highway consumption was rated at 3.6 L/100 km (or 4.5 L/100 km according to today’s Natural Resources Canada’s revised test procedures). The second-generation Insight was also an oddball from a design standpoint, but could now seat five people and consumed a combined average of 4.7 L/100 km (5.7 L/100 km by today’s standards). Like just about every hybrid model Honda ever produced for North America, Insight sales never picked up. Yet the company hasn’t thrown in the towel and is trying its luck once again. This time around, the 2019 Honda Insight is largely based on the Honda Civic, but boasts a different exterior design. It also distinguishes itself from the two previous generations with a conventional trunk instead of featuring a liftback. Seeking to rival the Toyota Prius, the Hyundai IONIQ and the Kia Niro, the Insight is equipped with an Atkinson-cycle, 1.5-litre four-cylinder engine, two electric motors and a 1.1-kWh battery pack. Combined output is rated at 151 horsepower, while the propulsion electric motor provides up to 197 pound-feet of torque, and the second electric motor acts as a starter/generator. Zero to 100 km/h is achieved in just under 9.0 seconds, which is adequate given its fuel-sipping mission. 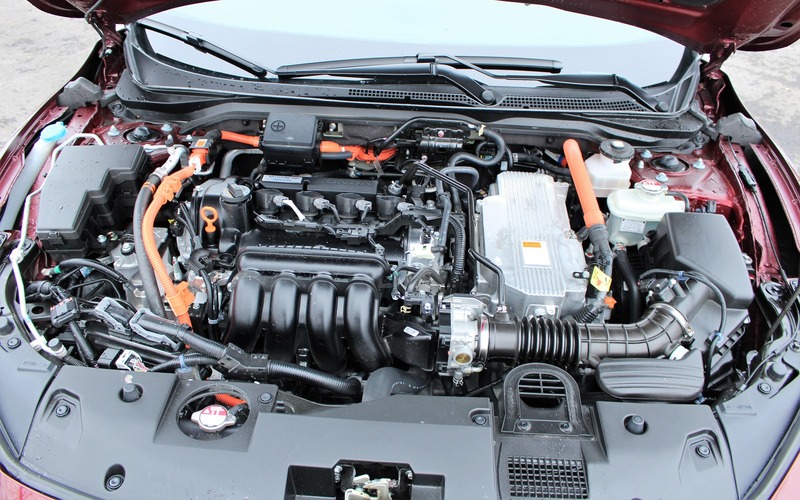 The Insight’s powertrain runs in EV mode at low speeds, shutting off the gas engine and decoupling it from the drivetrain. At city speeds, the four-cylinder mill can act as an on-board generator when it fires up, sending energy to the battery pack to feed the main electric motor. Mash the throttle, and a clutch immediately connects the gas engine onto the drivetrain for a combined effort with the electric motor. As in the Honda Accord Hybrid, there’s no conventional automatic transmission here. The 2019 Honda Insight consumes a combined average of 4.9 L/100 km. Great, but that’s a few tenths higher than what the IONIQ (4.1 L/100 km), the Niro (4.7) and the Prius (4.4) can muster. During our early winter test, the Insight consumed at a rate of 5.7 L/100 km. Just like in the Civic, front-seat occupants sit low to the ground in the Insight, but there’s plenty of space up front to feel at ease. The rear bench is sculpted for two posteriors, but if the middle occupant can stand the stiff cushion and floor hump, the Insight can haul five people as well as most compact sedans. Trunk space is unchanged from the Civic’s at 428 litres, tops in its segment—but there’s no inside grab handle to close the lid without get our hands dirty in winter. The dashboard layout is similar to the Civic’s, but the design and materials are different. 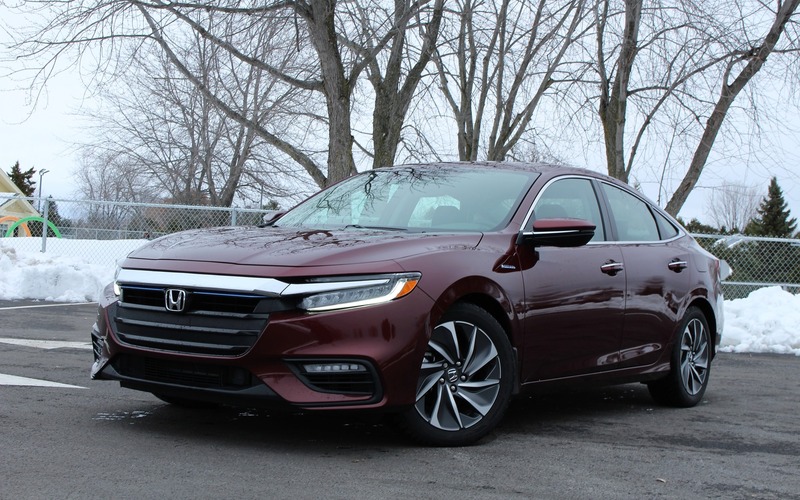 As in many other Honda and Acura products, the Insight gets a push-button transmission interface that lacks the intuitiveness of a conventional shift lever, although we get used to it after a while. The cabin is will insulated, its quietness disturbed only by the gasoline engine is it reaches higher revs. The infotainment system relies on an eight-inch touchscreen that’s fairly easy to use, flanked by a volume dial and a couple of physical buttons for quicker operation. Apple CarPlay and Android Auto integration is standard. The switchgear feels solid and all is within reach. In Canada, the 2019 Honda Insight starts at $27,990 before freight and delivery charges, and comes well equipped with 17-inch alloy wheels, dual-zone climate control, an intelligent key with remote engine starter, an eight-way power driver’s seat, heated front seats and an eight-speaker sound system. It also gets the full suite of advanced safety gizmos such as forward collision warning with autonomous emergency braking, automatic high beams, lane departure warning and lane keep assist, adaptive cruise control and Honda LaneWatch passenger-side blind spot display. Our Insight Touring tester also boasts a power sunroof, rain-sensing wipers, navigation, a power front passenger seat, heated rear seats, leather upholstery and a 452-watt premium audio system with 10 speakers, among other things. But no heated steering wheel. It retails for $31,890. Like the Accord Hybrid, the Honda Insight is a fine choice for those seeking a fuel-efficient vehicle, but don’t necessarily feel the need to stand out. It’s a more conventional looking car than the Prius and the IONIQ, with a more elegant design than the Civic’s. In addition, the hybrid powertrain works seamlessly, and we’ll always consume 5 to 6 L/100 km without ever needing to plug the car in. What the Insight doesn’t give us is the Prius and IONIQ’s eco-friendly statement or the Niro’s versatility and trendy SUV-like styling. Simply put, the Insight doesn’t draw any attention to it, and it doesn’t set new standards in the compact-car segment. For these reasons, it might end up being yet another model in Honda’s long list of commercially unsuccessful hybrids. That would be a shame. 8/10	Quite efficient, but the Prius and the IONIQ can do better. 8/10	Plenty of space for four, a little tight for five. Biggest trunk in its segment. 7/10	Enough power here for the daily commute. 8/10	Lots of features and easy to use while driving. Apple CarPlay and Android Auto capable. 6/10	Obviously, the Insight’s mission is to save fuel, not to handle like a Civic Si. 8/10	A very competent hybrid sedan that few people know exists.